I am a lover of salads. It’s a rare day that I don’t have a large salad for one of my meals. Occasionally though, the thought of making yet another large salad is unappealing. 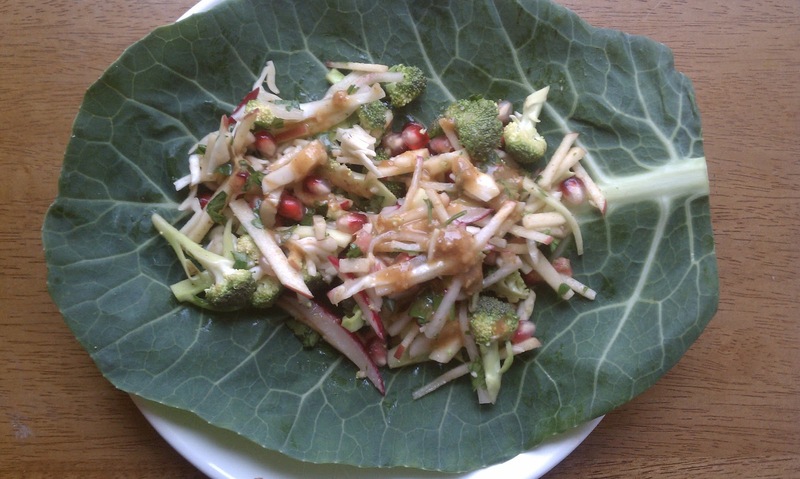 When I want to jazz things up, I will make a raw dish like zucchini pasta, a collard wrap, or soup. The other day, my creative juices were flowing, and these festive tacos were the result. They are bursting with flavor and are beyond amazing. 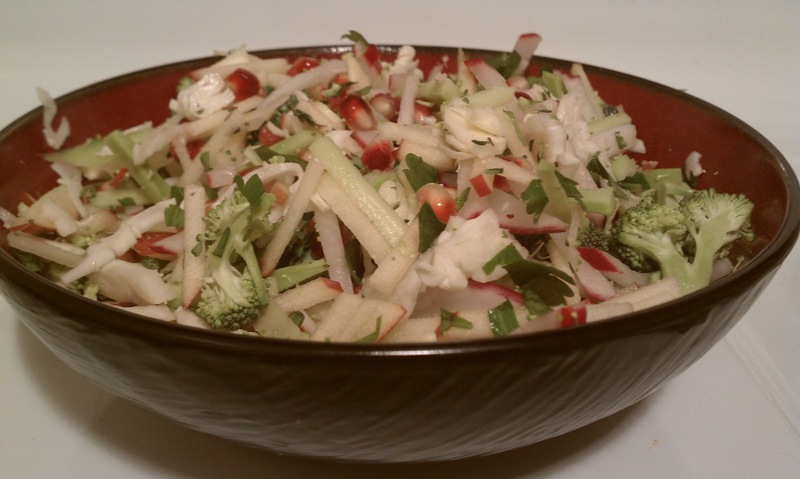 I combined crisp apples with crunchy raw vegetables and the sweet pop of pomegranate arils and tossed it all in a sweet and salty dressing. Garnish with pepitas (I added them after I took the pics). Heaven. Normally, I marinate the collard wraps so they are soft and lose some of the bitter bite. 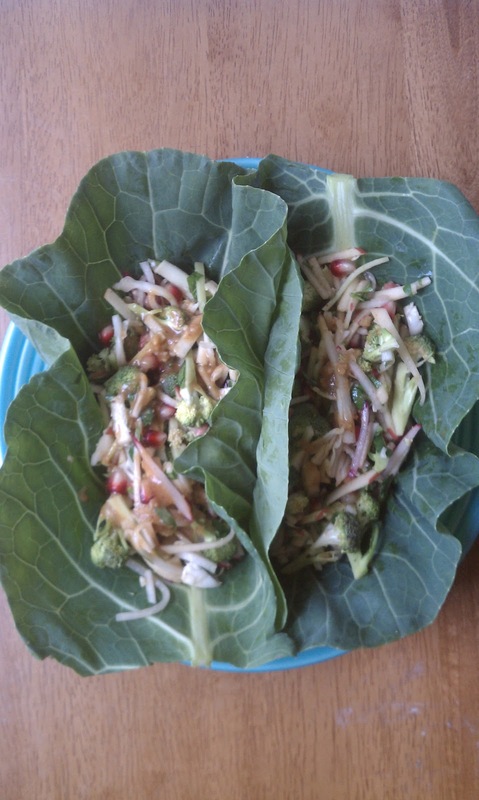 I chose not to do that for this recipe because I wanted it to be more like a hard taco shell (as much as a collard leaf can be) than a soft, pliable burrito wrapper. The lack of bitterness in the shell was a pleasant surprise. I’d encourage you to try it out. Nibble an end of the leaf. If it’s too bitter, a lemon and salt rub will solve the problem. Let’s take a minute to talk about sodium. I don’t think salt is a demon food, but I don’t think that it should be consumed with abandon either. We should be eating way less salt than we do, but people often forget that increasing dietary potassium is just as important. Even mainstream outlets are recognizing the important role that potassium plays in our lives. I’ve found that as I switched over to a well-rounded whole foods vegan diet (bonus: a diet that is naturally high in potassium! ), I wanted to use salt less and less. It is a wonderful agent for creating more pronounced flavor, but a pinch will do. Let’s not use salt as a crutch to overstimulate our taste buds. Let’s appreciate each food for what it is! When it comes to diet plans that restrict salt intake, Dr Fuhrman’s Eat to Live plan is one of the strictest ones I know. He recommends keeping daily sodium intake under 1,000 mg and mentions that 400-700 mg of sodium is provided from the natural foods you are eating. That leaves 300-600 mg of wiggle room. The dressing made without the miso meets Dr. Fuhrman’s recommendations, and is well within the sodium limits of other healthy plant-based diet regimens. Also, keep in mind that this is a very strict plan to follow- one that is used to reverse heart conditions, cancer, and many other modern diseases- and there’s no reason that a healthy person can’t relax those guidelines. If you want to make this a more substantial dish, the mellow nuttiness of steamed tempeh would be delightful, I’m sure. Alternatively, 1/4-1/3 cup of coarsely ground or chopped walnuts with the slaw and dressing would also be a worthwhile variation. -Cut off the bottom of the collard leaf stem, and shave off some of the thicker part of the stem. -Prepare the slaw and set aside. -Mix dressing together in a bowl with a fork. Toss slaw with the dressing. 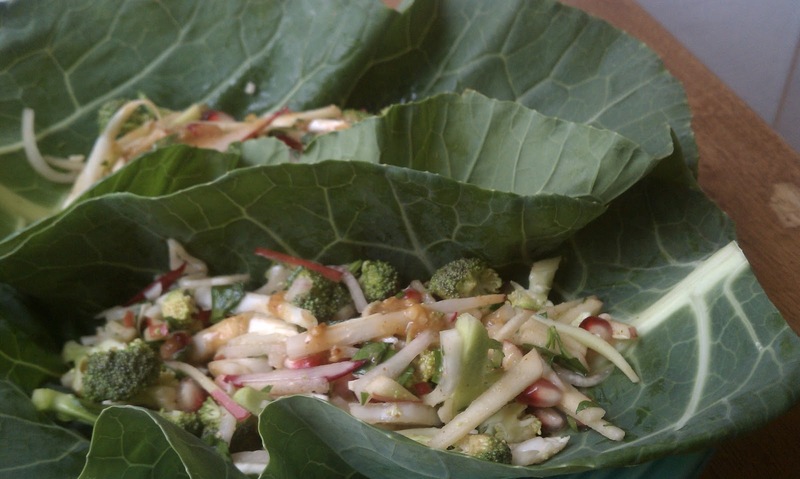 -Divide the slaw evenly between the collard leaves. Top with pepitas. -Plate the tacos and enjoy!